This is a service that I will perform for you, or a targeted person, to draw out matters of healing, forgiveness, emotional trauma, illness, or crossed up conditions. DURATION OF SERVICE; 3-5 DAYS. YOUR REPORT CAN NOT BE SENT UNTIL THE SERVICE IS COMPLETE! *****I will need details the symptoms you are experiencing. 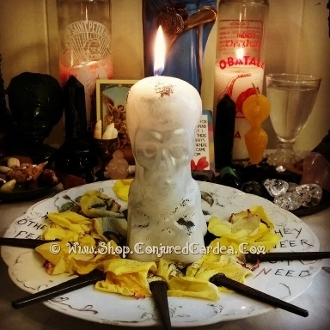 This service includes a loaded, dressed and fixed candle which is burned on my altar, along with the corresponding oils, altar set up, evocations, prayers, incense, roots and powder. Photo is an example of this service-each service is fully customized.